The Islamic Women’s Association wishes the whole Muslim Ummah a blessed and fruitful Ramadan. We pray to Allah to purify our intentions and accept our fasting, prayers and duas. We ask Allah to forgive us and have mercy on this Ummah in this month of forgiveness. Aameen. On the arrival of auspicious Ramadan Mubarak, we would like to take this opportunity to wish you and your family, friends and all entire humanity the blessing and Rahmah of Ramadhan Mubarak. May Allah grant us the Taufik and Hidayah to serve the Muslim and their humanity. Alhamdulillah! Through the unique but Divine institution of fasting in Ramadaan, we are able to identify with our brothers and sisters on the Australian Continent. We commend highly the outstanding initiatives and achievements of the Crescents of Brisbane which seem to be the perfect binding agent of the Community. Through your columns, all of the SANHA family of management, staff, certified establishments, friends and well-wishers, we pray that all our Muslim brothers and sisters have a spiritually uplifting and rewarding Ramadaan of peace and prayer, Aameen. Are you of a diverse cultural background or a recent migrant to Queensland and thinking of starting a business? The workshop will also feature video interviews from six culturally diverse business owners which share the benefit of their experiences in setting up and operating a business. Former Chair of the Council of Aboriginal Reconciliation, Pat Dodson, delivered the opening keynote address at the inaugural Muslim conference hosted by the University of Western Sydney. The Muslim Students - Access, Inclusion and Success Conference was held recently on the 3rd-4th of September 2007. These young Muslim men left their homes in the Dutch East Indies colonies and came as indentured workers subject to the whim and discretion of the European Pearling Masters who controlled the pearl industry at that time. They were set to work among the Aboriginal people who had been black birded by the same Pearling Masters and forced to free dive from the luggers to the bottom of the ocean so as to retrieve the highly valued pearl shells. "............... the most successful encounter ever between any two cultures on this continent"
Muslim indentured labour and Aboriginal slave labour – representatives of two ancient cultures – the visitor and the land owner suborned to the money making needs of yet another culture. This unequal, master/worker experience between Muslims and the colonial Australian society stands in contrast to the first encounter between Muslim people and the Aboriginal Australians an engagement that had occurred 300 years before the arrival of the first pearl lugger off the North West Coast of Australia and established a relationship that was to last for three centuries. It has arguably been the most successful encounter ever between any two cultures on this continent. Two cultures who met to trade and exchange commerce, two cultures that showed mutual respect and understanding of each others values, language, customs and laws. Two cultures that sustained a co equal relationship for three centuries without ever having fought a war, they never sought to establish government over the other, they traded and engaged in commerce as business partners and never felt so insecure in their own culture that they needed to destroy or diminish the cultural symbols of the other. "The greatness of the Muslim societies was underpinned by the skill of your architects and engineers, the wisdom of your philosophers, the words of your great poets, the bravery of your soldiers and the acumen of your businessmen and women"
By the end of the 19th century the colonial authorities in Northern Australia were so worried about the relationship between the Macassans and the Arnhemlanders (Yolgnu) and its strength that the Macassans were banned from northern waters and the trade between the two cultures was deemed illegal. Perhaps if the model of engagement established by the Muslims of Macassa and the Aboriginal people of Northern Australia had been adopted by the English when they decided to invade in 1788 then the history between us all over the past 220 years may have been a very different story. The language of the Macassans and the beautiful trees that they planted over three centuries are part of the lives of the Aboriginal people of Arnhemland to this day and the descendants of the Afghan merchants and camel train drivers are represented in our parliaments and in commerce and industry throughout Australia. But in each case these Muslim communities and the Aboriginal people have sustained their relationship. "Muslims did not differentiate between their responsibility to their faith and their worldly profession. To behave ethically and honestly in your trade is a religious responsibility as well as commercial good practice"
The nature of engagement by different Muslims groups in this country has varied a great deal. By and large the experience has enriched all who chose to engage. In this country, in recent years our capacity for engaging and embracing the best aspects of the cultures and values of different societies has been sorely tested. Our multi cultural society built on the back of tolerance, patience and a capacity to see the worth of our fellow human being has become a point of mockery and derision for some in our society. They are so insecure in their own culture and values that they cannot abide others who value diversity and difference. The Muslim Community of this country has a long and proud history which is simply an extension of a much longer and greater history going back to a time when Christian civilizations were on the verge of collapse and entering a period of their own naming - the Dark Ages. The greatness of the Muslim societies was underpinned by the skill of your architects and engineers, the wisdom of your philosophers, the words of your great poets, the bravery of your soldiers and the acumen of your businessmen and women. Muslims did not differentiate between their responsibility to their faith and their worldly profession. To behave ethically and honestly in your trade is a religious responsibility as well as commercial good practice. "If you choose the path of assimilation into the Australian society at the price of your Muslim identity you will perhaps secure your personal elevation but then be simply an Australian of Muslim descent"
So for young Muslims in this country you have come with some very serious responsibilities to carry on the traditions of a society and a faith that has set some very high benchmarks. Benchmarks established centuries ago but as relevant to your lives today as they were to your forebears. These are benchmarks that have seen Muslims as leaders in every sphere of the arts, the sciences, law and the humanities for centuries. A failure by young Muslims in this country today to defeat intolerance and racism and so become an underclass excluded for a generation is an unacceptable outcome for yourselves as individuals but also for our community. If you choose the path of assimilation into the Australian society at the price of your Muslim identity you will perhaps secure your personal elevation but then be simply an Australian of Muslim descent. On the other hand if you are able to take the path that aligns the values of your society and your faith with your responsibilities as a citizen then you have an opportunity to establish yourself as an Australian Muslim citizen with an amalgam of the best that these two elements represent. What your $15 will buy a family in South Africa. Author Dr Abdel Bari Atwan was finally granted a visa to attend the Brisbane Writers Festival last week and even got to the Sunday taraweeh Ramadan prayers at the Kuraby Mosque. Gold Coast Mosque Imam Imraan Husain appears on the cover page of the Weekend Gold Coast Bulletin Ramadan feature article along with (L to R) Zainuddeen Husain, 5, Jamel Hadi, 6, and Jaeden Hadi, 9. 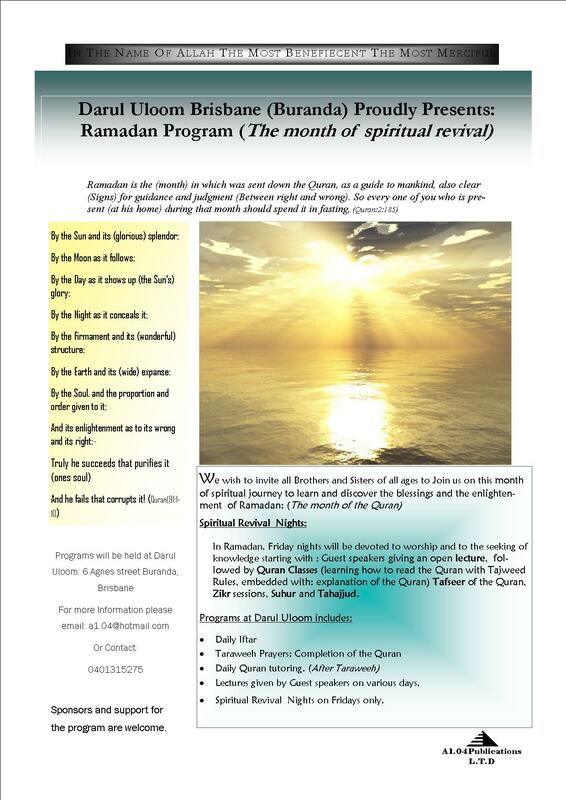 In the feature article, Imam Husain explains how the sacrifice during the month of Ramadan unites Gold Coast Muslims. He said most non-Muslims would not realise they were making the sacrifices made during Ramadan in the course of their everyday lives. "The thing about Ramadan is that (by looking at you) the rest of the community doesn't know what you're doing," he said. "You could be standing next to someone on the bus and they wouldn't know you haven't eaten so far that day. "You still go to school, you still go to work, students still go to university. It is just part of your life. "It makes you a better person." He said Ramadan was an obligation. "There are many spiritual benefits because you are disciplining yourself to control your desires in your daily routine," he said. "It takes perseverance and persistence. It makes us healthy and it unites the community." A new book documents the U.S. participation in 1979 Mosque Siege. The wave of Islamist violence that culminated in the Sept. 11, 2001, attacks can be traced to a sunny November morning almost 28 years ago. Then, hundreds of Islamist radicals from several countries seized at gunpoint Islam's holiest shrine, the Grand Mosque of Mecca, with nearly 100,000 pilgrims inside. As the rebels turned the mosque's minarets into sniper nests, Saudi Arabia's shaken royal family imposed a near-total news blackout, and sent in the troops. The siege lasted two weeks. Crushing the rebels, who were led by Saudi preacher Juhayman al Uteybi, required the use of artillery, heavy armor and poison gas -- as well as assistance from the Central Intelligence Agency and French commandos. Hundreds, if not thousands, of people paid with their lives. Osama bin Laden -- whose family had constructed much of the mosque -- has cited the bloodbath as a major reason for turning against the House of Saud. A new book by Wall Street Journal foreign correspondent Yaroslav Trofimov tells the story of this drama, and of the world-wide upheaval it presaged and reveals how Americans were involved from the first days of the crisis -- on both sides of the barricades. 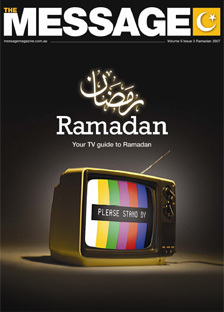 In the Shade of Ramadan is a series of educational and motivational reflections on the month of Ramadan featuring Dr.Esam Omeish, Dr.Souheil Ghannouchi, Sh. Suhaib Webb, Imad Bayoun, Marwan Marouf, Muslema Purmul and more. The Symposiums and Expos on Australian Muslims sponsored by the Department of Families, Community Services and Indigenous Affairs (FACSIA) and held around the country over the past several months has culminated with the compilation of the highlights, statistics and selected stories of achievements from each of the states and territories. Download the booklet for some local references. 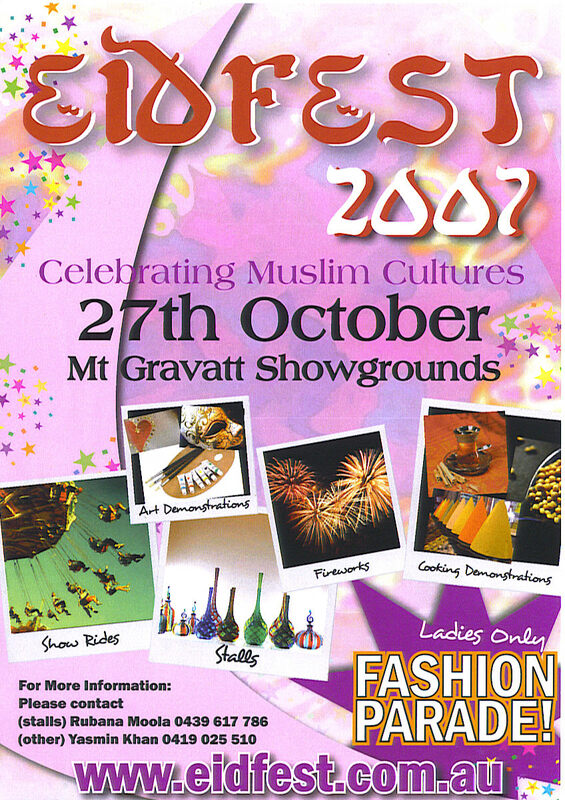 Well known media personality and former host of ABC Radio National Sandy McCutcheon will chair a forum on "Muslim Perspectives and Promises" at Eidfest on Saturday 27 October. "We are proud to have Sandy hosting the forum as he is currently sharing his time between Morocco and Brisbane", a spokesperson for Eidfest told CCN. "He obviously now has first hand knowledge of Muslim culture and will be providing not only his insightful view, but also an impartial view", she added. 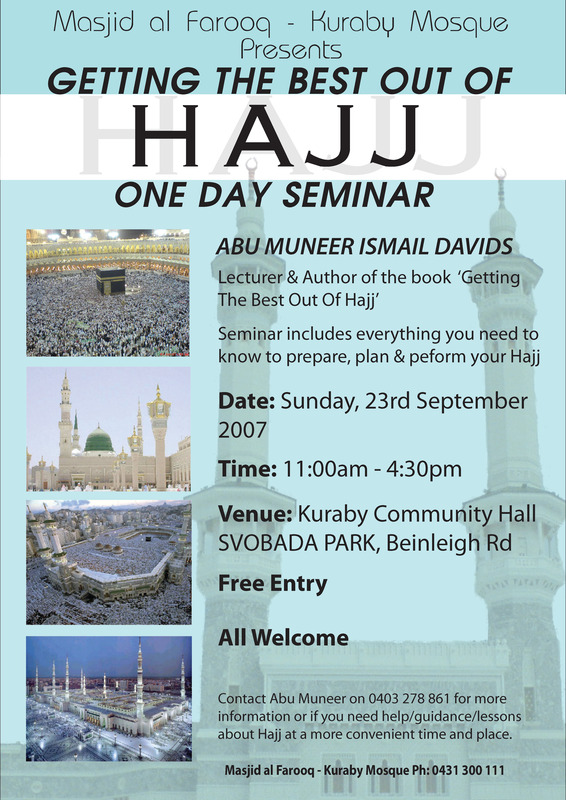 The forum will include among others, Dr Mohammed Abdalla, and Ms. Rashida Joseph and will commence at 3pm at the Mount Gravatt Showgrounds. Sandy McCutcheon was brought up in New Zealand and moved to Australia in the 1970s. Most of his working life has been spent in either radio or theatre. He has worked as an actor and director and has written 22 plays that have been professionally produced. He is also a best-selling author. 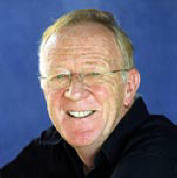 In his broadcasting career, Sandy has worked in both commercial and public radio with the highlights being his time on Double Jay and his present position as the producer/presenter of Australia Talks Back heard every weekday around Australia on ABC Radio National and overseas through ABC Radio Australia. He also presents and produces a monthly book discussion program on Radio National called Australia Talks Books. He has produced radio documentaries in many parts of the world including Bosnia, Yugoslavia, Malaysia, Singapore, China, Mozambique, South Africa and North and South Sudan. Sandy's novels, "Peace Crimes", "Poison Tree", "Safe Haven" and "Delicate Indecencies" are all bestsellers. He has also written two non-fiction titles and an illustrated children's book called "Blik!". Two new novels are due out next year. Sandy and his wife - photojournalist Suzanna Clarke - own a riad in the old medina of Fez in Morocco which they use as a writing retreat. Sandy divides his time during the year between Brisbane and Morocco. 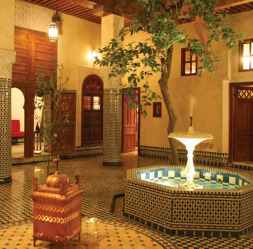 [Editor] A riad is a house with a garden in the center, usually with orange and lemon trees (the Arabic word riad means garden). The garden is sometimes in the center of the house, and sometimes the house is U-shaped with the garden on the fourth side. Have you got The Message? The latest edition of The Message Magazine has just been released. Visit www.messagemagazine.com.au where you can download this edition, as well as previous ones. This is an open invitation to you and your family to attend the breaking of your fast (Iftaar) on Saturday 29 September at Algester Mosque. UP to $1 million will be pumped by Saudi Arabia into an Australian university, sparking fears the money will skew its research and create sympathy for an extremist Muslim ideology espoused by al-Qai'da. Muslim leaders and academics have attacked Queensland's Griffith University for accepting an initial $100,000 grant from the Saudi embassy, which they accused of having given cash in the past to educational institutions to improve the perception of Wahhabism - a hardline interpretation of Islam. 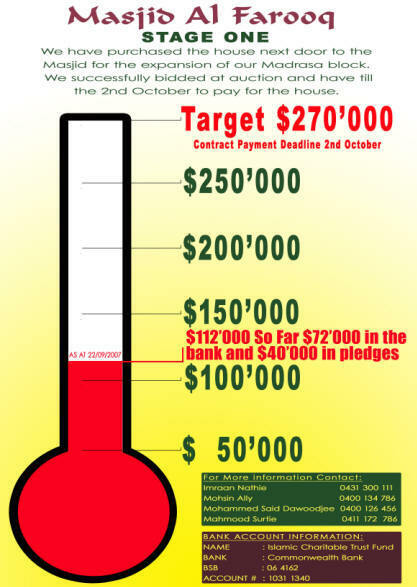 The Australian understands the Griffith Islamic Research Unit will in coming years receive up to $1 million from Saudi Arabia, which has injected more than $120 million into Australia's Islamic community since the 1970s for mosques, schools, scholarships and clerical salaries. A DOCUMENT describing Osama bin Laden as a courageous "resistance fighter" - used by authorities to portray Guantanamo Bay detainee Mamdouh Habib as a terror threat - has been exposed as a TAFE assignment written by his wife. An investigation by The Weekend Australian into the allegations against Mr Habib has revealed that the terrorism file on him held by authorities contains handwritten notes from a presentation given by his wife, Maha, to her classmates in 1999. At the time, bin Laden was years away from ordering the September 11, 2001, attacks on New York and Washington. But the Saudi terrorist had already issued fatwas calling on Muslims to kill the military and citizens of the US and its allies. "There is a person that I really admire & wish that one day my family & I will get to meet him in person," Ms Habib wrote in the introduction to the speech. The Habibs have only recently become aware of the documents, and were shocked to discover they were selected paragraphs from a speech Ms Habib gave in her night-school course, Communications Skills Certificate III. Ms Habib still has the rest of the notes for the speech, for which she received "very good" marks from teacher Jan Boyd. QUEENSLAND really is the place to live. The Sunshine State is the nation's fastest growing state, has record low unemployment, a strong economy and, according to the latest Real Estate Institute of Queensland median house prices, a very solid property market. "Population migration into the Sunshine Coast is continuing and that is having a positive impact on prices and sales activity," REIQ Sunshine Coast zone chair Lloyd Edwards said. The expat community and skilled migrants from the United Kingdom and South Africa are also having an impact on the Sunshine Coast market especially in the areas where private educational institutions are located such as Buderim, Sippy Downs and Kawana. "They are predominantly looking to buy a home in the $800,000 to $2 million price range," he said. The story of devout Muslim and the greatest goalkicker the game has seen Bulldog star Hazem el Masri. Entries for the 2007/08 Premier's Multicultural Photographic Awards are now open. Your chance to win a total of $25,000! The Premier’s Multicultural Photographic Awards seek entries which respond to the theme ‘New Beginnings’. showing a new element or benefit brought about by cultural diversity. Reports of the demise of Nelson Mandela are highly exaggerated despite what the leader of the free world might have to say on the subject. In yet another embarrassing gaffe US President George W Bush alluded to the former South African leader's death in an attempt to explain sectarian violence in Iraq. "It's out there. All we can do is reassure people, especially South Africans, that President Mandela is alive," Achmat Dangor, chief executive officer of the Nelson Mandela Foundation, said as Bush's comments received worldwide coverage. In a speech defending his administration's Iraq policy, Bush said former Iraqi President Saddam Hussein's brutality had made it impossible for a unifying leader to emerge and stop the sectarian violence that has engulfed the Middle Eastern nation. I heard somebody say, Where's Mandela?' Well, Mandela's dead because Saddam Hussein killed all the Mandelas," Bush, who has a reputation for verbal faux pas, said in a press conference in Washington. The federal election will be upon us soon. ECCQ wishes to give people from ethnic communities, the multicultural sector and anyone interested in multiculturalism a chance to hear the policies of the parties contesting the federal election. We have invited all the major parties to address a forum on Friday, October 5, 6pm to 9pm at the Colossus Hall, 21 Jane St, West End. 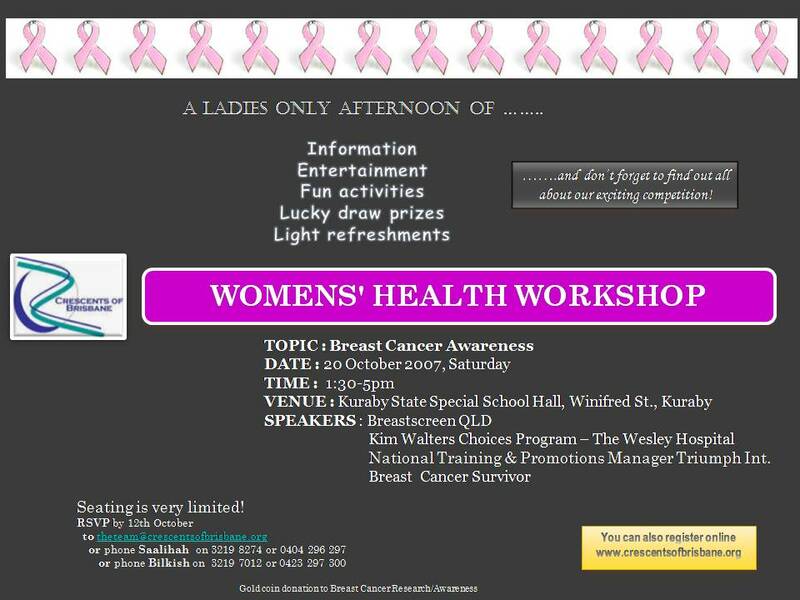 We will send out further information once the speakers are confirmed. Your informed vote is important so please mark your diaries to come to this important election forum. If you are not enrolled to vote it is important to enrol now as the roll closes at 8pm on the day the election is called - forms are available at all post offices. A: A rowing machine will be great for you because it works both upper and lower body (as swimming does). If you're lucky enough to have one at home, try rowing for at least 20 - 30 minutes daily. The other alternative would be the cross-trainer, which gives you the 'upper body' option. Remember, if you don't have any equipment at home, you can always WALK - it's the cheapest and easiest way to keep fit!!! Mula Nasruddin and his wife Mumtazin were having problems at home and were giving each other the silent treatment. Suddenly, Mula Nasruddin realized that the next day, he would need Mumtazin to wake him at 5:00 AM for an early morning caravan trip to the city. Not wanting to be the first to break the silence (and LOSE), Mula Nasruddin wrote on a piece of paper, "Please wake me at 5:00 AM "
He left it where he knew Mumtazin would find it. The next morning, Mula Nasruddin woke up, only to discover it was 9:00 AM and he had missed the caravan. Furious, he was about to go and see why Mumtazin hadn't wakened him, when he noticed a piece of paper by the bed. The paper said, "It is 5:00 AM. Wake up. Acacia Ridge Futsal Centre, 1391 Beaudesert Rd.